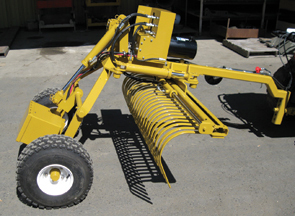 Rock Rake – SWECO PRODUCTS, INC. The Sweco Rock Rake is electric over hydraulic. It is built for tough work and will accurately level, fill, and move loose soil and crushed stone on small and large jobs. The teeth are spaced 1” apart enabling the operator to remove rock, roots and undesired debris.